On Saturday my husband Sam went to the local Ballarat Lakeside Farmers Market to pick up some of my favourite soap. I’m fussy you see about what soap I use. Only in sheer desperation will I buy a block of Pears from the supermarket – which is just to get me through until I can get my next fix of handmade olive oil based soap. Good old fashioned lavender is my favourite and I’m not a fan of too many bits in my soap that might scratch. The bigger the block the better too because they seem to disappear fast in our house (it may have something to do with the littlest one in the house who is very good at washing his tummy!). 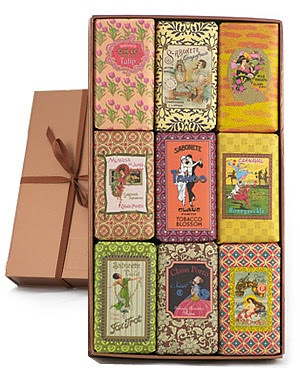 I also love french milled soaps in beautiful packaging (like the gorgeous portugese made soaps from Claus Porto. I also love soaps that have been made in molds with embossed writing. A couple of years ago I collaborated with a friend and we made a lovely lavender and aloe vera soap and a lemongrass and green clay one and I packaged them up as Bushka soaps – it was in the lead up to Christmas and they sold out at my market stalls – all this talk of soap – makes me want to do this again….the Crafty Squirrel could do with some lovely soap for sale! Watch this space!